I love sushi but I am also trying to reduce my intake of simple carbs. 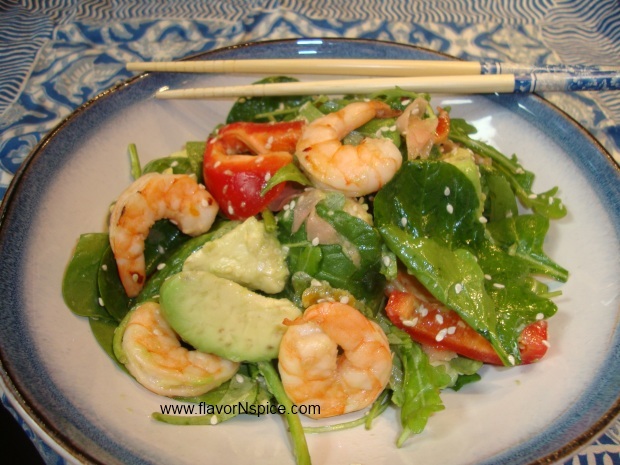 Of course, I could try making sashimi but then I miss out on balancing my diet – so the compromise for me is to make a green salad (baby arugula and baby spinach)with some of the elements of sushi that I love. So I made a salad with roasted shrimp (marinated in some classic sushi flavors such as soy sauce and rice vinegar), sushi ginger, avocado and toasted sesame seeds. This salad tastes absolutely delicious and is very healthy – it would make for the perfect lunch if you are on a diet or even a great first course for a formal dinner! 1. Wash the shrimp under cold water and then completely dry them using kitchen paper towels. 3. 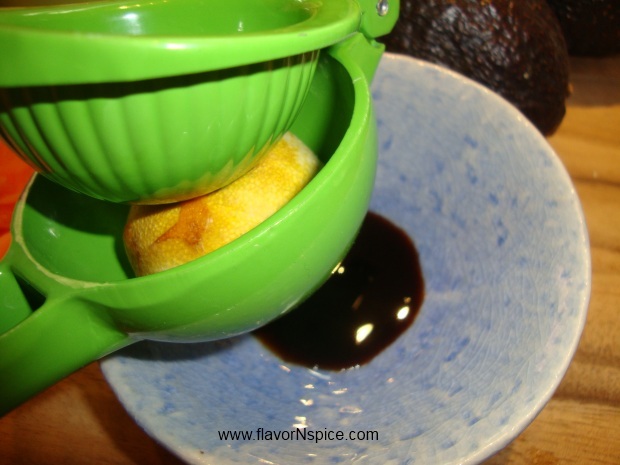 Prepare the marinade for the shrimp by combining the following in a small bowl – one tablespoon of soy sauce, 1 tablespoon of rice vinegar and one tablespoon of Orange marmalade. Whisk all these together. 4. 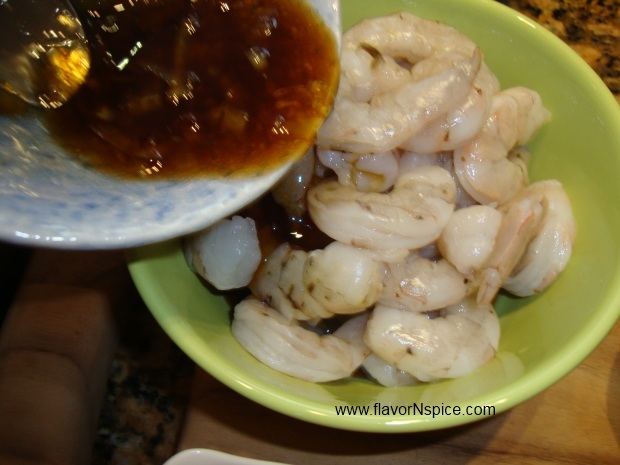 Pour the marinade over the shrimp and stir everything. 5. Cover a small cookie sheet with tin foil and spread out all the shrimp over the tin foil. 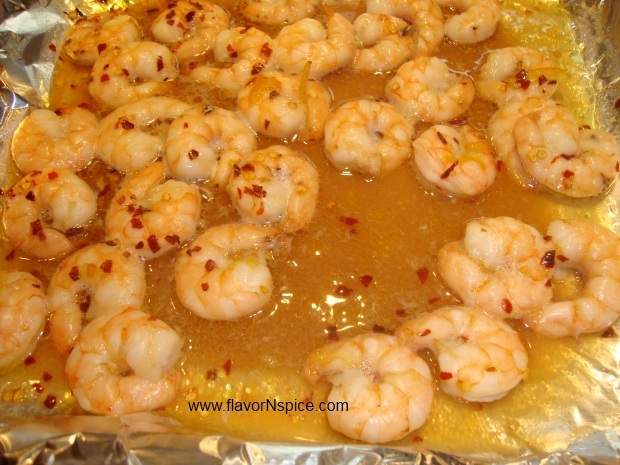 Do not crowd the shrimp over the cookie sheet – they should be evenly spread out. 6. 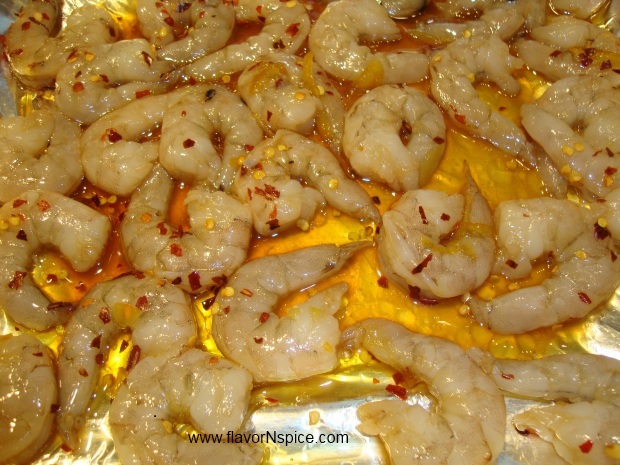 Drizzle one tablespoon of extra virgin olive oil over the shrimp and move them around on the cookie sheet so that the oil gets evenly coated all over the marinated shrimp. 7. Sprinkle red chili and ground black pepper flakes over the shrimp. 8. 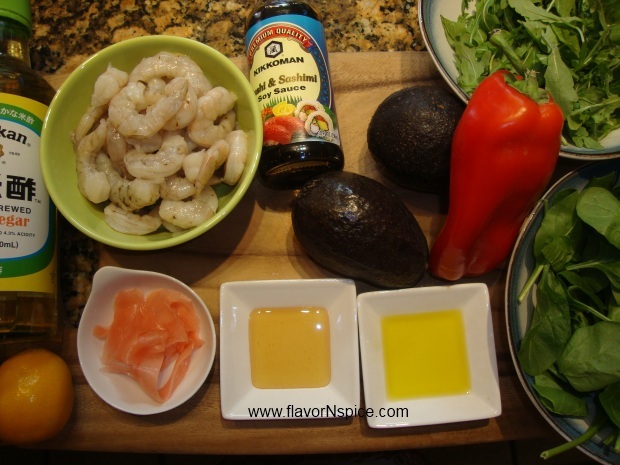 Place the cookie sheet with the marinated shrimp in the oven for 10 minutes. 9. 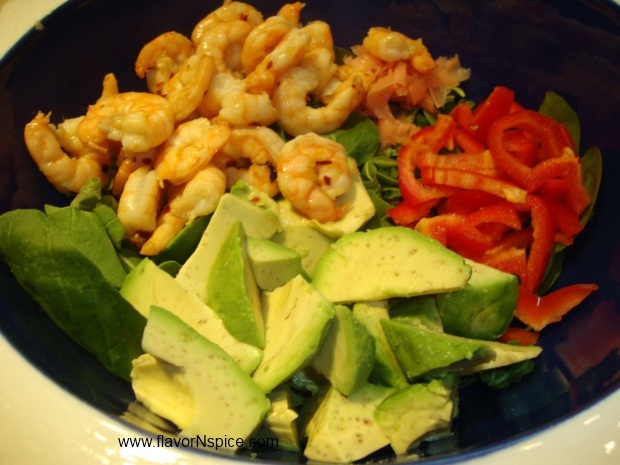 While the shrimp is getting roasted prepare the salad by peeling and chopping the avocados and also chopping the red bell pepper. 10. 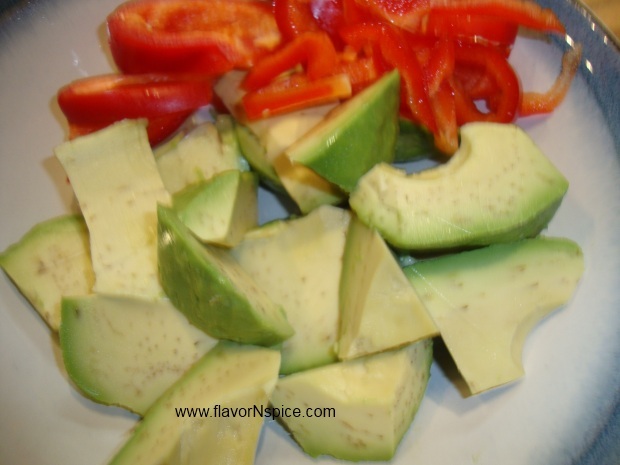 Place the arugula and spinach leaves in a large salad bowl and pour the avocado and red bell pepper pieces over the salad greens. 11. 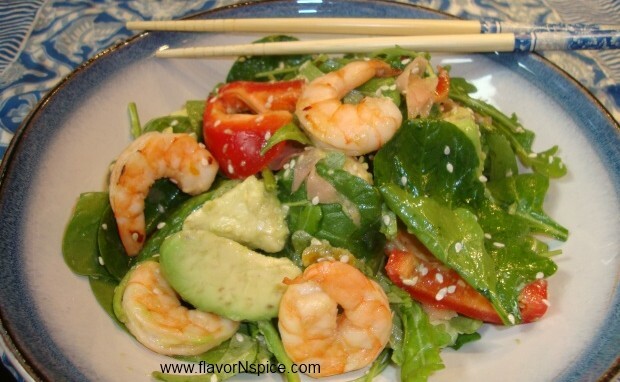 Finely chop the sushi ginger and place it over the salad leaves in the bowl. 12. To dress the salad, prepare a dressing by whisking in the following ingredients in a small bowl: 1 tablespoon of honey, one tablespoon of extra virgin olive oil, one tablespoon of rice vinegar and salt. 13. Take the shrimp out of the oven and let them cool down for 5-6 minutes. 14. 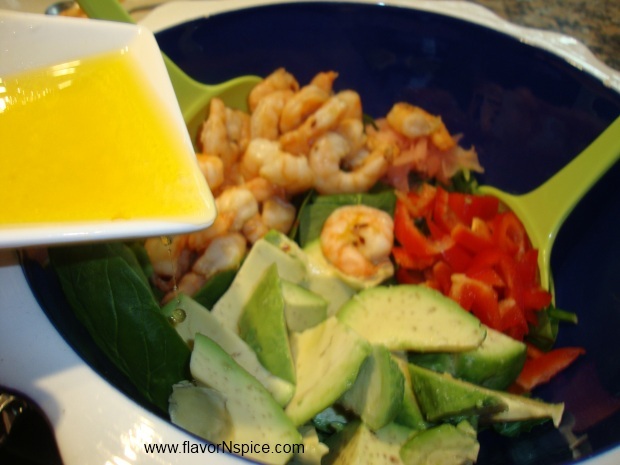 Take the shrimp off the cookie sheet and place it in the salad bowl. 15. 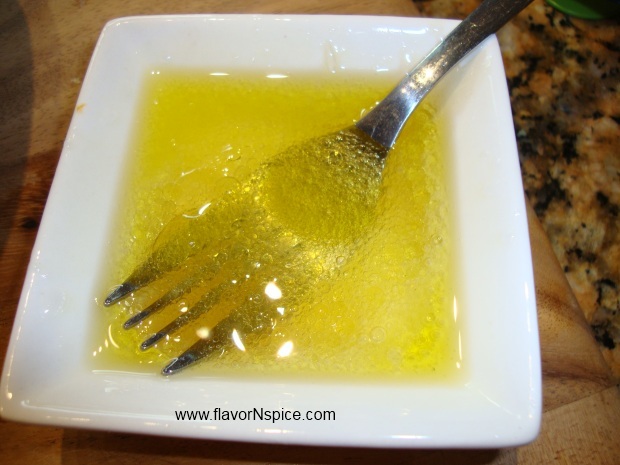 Pour the dressing over the salad and gently toss it with a pair of salad servers. Toss very gently or you might mash the avocado pieces. 16. 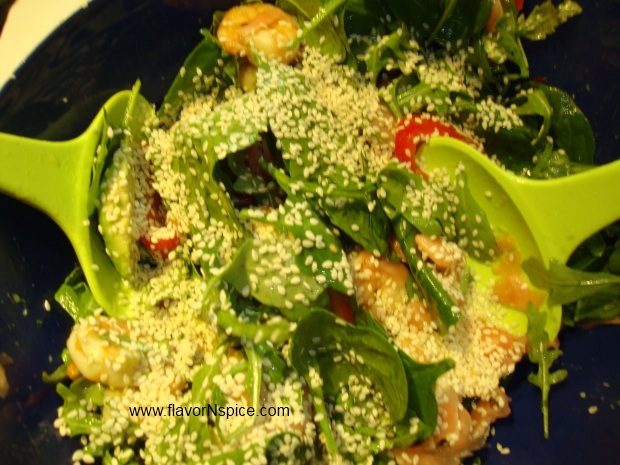 Sprinkle the toasted sesame seeds over the salad and toss again. 17. Serve the salad immediately or the salad leaves start to wilt. flavours are on my mind right now. Thanks Daphne! Let me know how it turns out when you make this! My husband and I both love this recipe and it has become a staple in our household because we are both trying to eat healthy foods (but we can never compromise on taste!). Have fun in Thailand – I love that culture and absolutely adore Thai food! I heartily agreed. 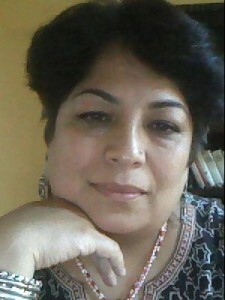 Thanks, Shabnam, it was great! Thank you so much for sharing this on Seafood Frenzy Friday. My family loved this one! Thanks for sending me feedback Carrie 🙂 yes, this is a favorite with my family too – its so easy to make and yet so delicious!